So "tomorrow" doesn't really mean tomorrow in my world, I guess. A few projects I've finished. This pattern has become my "standard" sock pattern. I know, I know, everyone else and their brother has knit 17 pairs already. Behind the curve or not, these socks are fab. 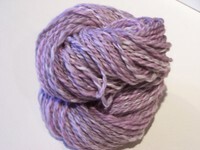 I've got a pair going in a beautiful Yarn Hollow colorway (it escapes me now) for the holiday party at Inish Knits. We're having a Christmas party with cookies and cocoa, but we're adding a fun twist. 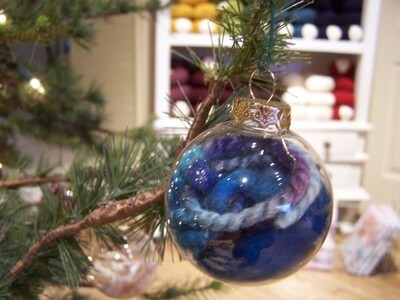 Anyone who is interested in participating in a gift exchange can bring a handcrafted gift, but no one is "required" to participate. Daryl Webster has a knockout pair of stranded mitts knit from a pattern that she created from transposing a weaving pattern. Phenomenal, they are. I'll post pictures of the party on Thursday morning. 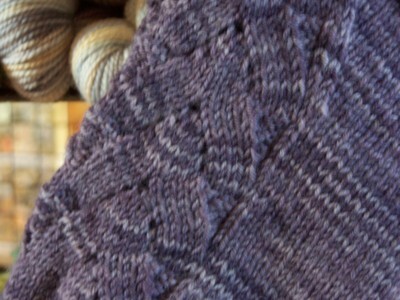 I'm trying to crank out as many shop patterns for Inish Knits as I can. 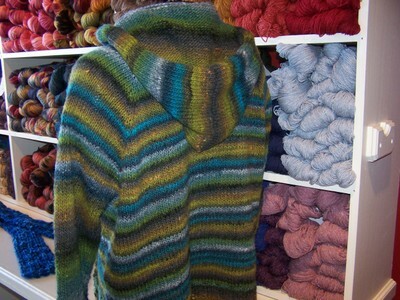 There are several beautiful sweaters that are floating around out there, in the process of making their way here. I just can't wait to see them in the flesh! Really beautiful patterns that should inspire customers to challenge themselves just a little. I've also been trying to put myself out "there" as much as I can--in terms of the Internet. I've been working closely with Cheryl Cigan from known.com; the goal is to get the good word out there that Inish Knits is Northern Michigan's premier resource for all things knit. You can check out her brilliant work here. 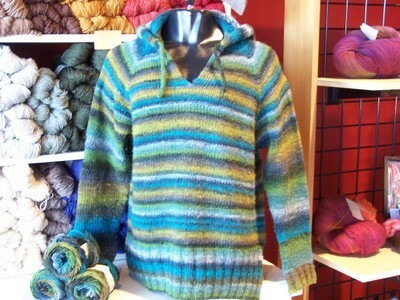 We're working on finalizing the text, but I think it's a really nice sneak peak into what Inish Knits has to offer. And of course, this is the last step before we set up a website. Okay. For real. This is the beginning of the end. My commitment to blogging starts here. True fact. I have been a knitting fool. More pics of finished knitting projects tomorrow. But first, I'd like to introduce you to a friend of mine. Chauncey is a beautiful specimen of the Schacht Matchless DT variety. I picked her up at SOAR in October at Shanty Creek. 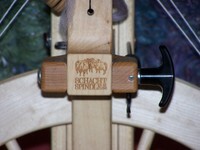 Inish Knits has had a Schacht dealership since 2003, and I figured it was time I invested in a shop model. I would be lying, however, if I said that I didn't have my best interests in mind. Chauncey is my first "real" wheel. The first wheel that I took the time to research and play with and decide what was truly a good fit for me. I am at the point as a spinner that I am comfortable sitting down at different wheels to spin; I now have the capacity to determine what I like, what works for me and the general "feel" of the wheel. A year ago, I couldn't have done that. And honestly? It was a matter of minutes before I knew this was The Wheel. Not just the wheel of the moment. Or the wheel for this year, or for this phase of my life. 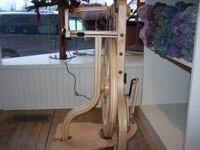 I can't imagine ever "growing out of" this wheel, what with its buttery smooth treadling, or its silent, effortless wheel rotation, or even its shapely blond form that is both graceful and stark at the same time. 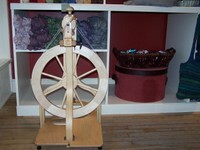 And depending on what you want from your spinning as you progress, there are five other whorls available, ranging from super high-speed and extra slow bobbin options. 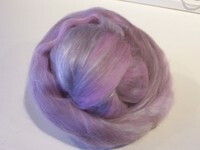 A little sample of what I've been spinning. Copper Pot Woolies, a blend of 70% Merino, 20% Tencel, 10% Colonial roving named "Chantilly Lace", purchased in July 2007 at the Fiber Festival at Castle Farms in Charlevoix. Lovely stuff. I have 8.9 oz. 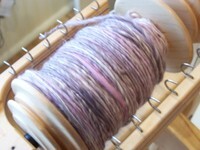 total, and I have plied about 110 yards so far, one bobbin is ready to ply and I've got about 2.5 oz. (?) left to spin. It's a 2-ply, and I'd say a heavy-worsted-bordering-on-bulky-weight. The sun is shining, I have a freshly roasted, freshly ground cup of coffee in hand and an afternoon to knit, spin and boogie to Bob Dylan. Here's to the good life.